In early September I had an opportunity to venture out on a Canadian fishing expedition to a remote lake in Canada. 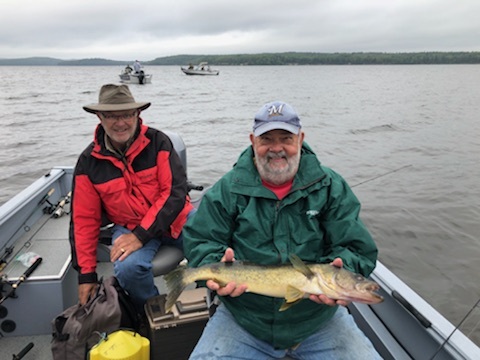 Jerry, a friend of mine asked me to join a group of five other fishermen to spend a few days on Gullrock Lake, which is a 16, 707 acre lake located in Sunset County, Ontario. It is part of a five lake chain with Red lake being its headwaters. It is noted for good walleye fishing and has some excellent northern action also. Four members of the group have been fishing this lake chain for several years and have formed a close knit fraternity stretching back many years when they worked together as Iowa bankers. The fifth Iowa member, Dana, was in the insurance industry and was also a newcomer. Jerry and I joined the rest of the group coming up from Iowa and the six of us made the long journey to our destination in Tom’s vehicle. Tom, who is also a hot air ballooner, pulled his large balloon trailer to transport our gear making the trip quite enjoyable and comfortable. On reaching our destination, we unloaded our gear into a spacious cabin equipped with all the amenities of home. This would be our home-base for the next eight days. Our fishing boats consisted of two wide, 17 foot cruisers propelled by 50 horse powered motors which proved more than adequate for the many miles we traveled each day to get to our fishing destinations. Tom organized the group of six anglers into different fishing groups each day to allow folks to get to know each other and share personal experiences and stories. This was a great way to break the ice with the newcomers and form new and renew old relationships. Canada has become very conservation minded in their fishing regulations in recent times. This is a great approach to sustain the Canadian fishery which will continue to be the “go to” destination to experience the ultimate fishing experience. The eight day conservation license, with all the taxes, service change and three year “outdoor card” came to $45.30. This allowed the holder to catch and keep two walleyes and two northern each day with a similar possession limit. Gullrock Lake and the adjoining lakes permitted walleyes to be possessed up to 18 inches with larger ones returned to the water. Northerns up to 29 inches could also be harvested. The assured that the larger female fish, which are the basis for reproduction capacity, will remain in good numbers to keep the fishery viable! During our stay, we caught hundreds of walleyes and ate fish each day except for “steak day” which served up a huge, succulent beef steak for that day’s culinary supper venue. Tom was the chief cook while Jeff was the fish fryer extraordinaire. We each took turns doing dishes and clearing the table. This worked out well and we never left the table hungry! The size structure of the fish was very good with lots of 14 to 18 inch walleyes caught with many in the 20 to 25 inch range. My largest walleye maxed out at 27 inches while two 28 inches were boated by Jeff and Craig. The largest northern which was caught by Dana on a “red-eye” was 36 inches. There wasn’t much time spent “not catching fish”! We had a daily “bet” each day for the largest walleye and northern caught. I luckily broke even for the eight days on the water. The wind at time was a problem but we spent fishing time vertical jigging our minnow and night crawlers keeping the boat in a stationary position. While fishing is the main venue offer by the lodges, grouse and waterfowl hunting seasons are also a possibility. Large game such as bear and moose can be a draw when the fall hunting season opens. We observed a large flock of 10 grouse scurry through our cabin site while huge strings of Canada geese were observed moving south on their way to warmer climes. Several large groups of hooded mergansers were also sighted. Eagles were aplenty with each island sporting a pair. Several times we saw eagles lumbering onto shore with a large fish that was consumed with vigar. This time of year is a great time to be outdoors enjoying all nature has to offer! The fishing was great on this trip but what is “frosting on the cake” was the opportunity to meet new friends and experience a truly memorable group of guys. While fishing was great, the card games over a few cold beverages after our evening meals and the camaraderie throughout the gatherings rounded out the trip. We had some great times and the stories told and jokes shared will last a lifetime. A great time was had by all!